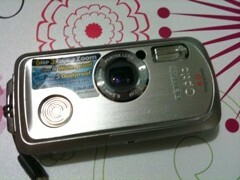 The first camera I owned was a casio exilim digital camera. I forget the model but it was one of the better ones then that I could afford. The next camera I bought was a waterproof camera – a pentax optio wpi with just a 6mp resolution! I think this was in 2007 or so. This is one pas des deux that you don’t see that often. It probably took them a while before they perfected this routine! Simply amazing! There were so many breathtaking moments. Watching it live would’ve probably shot my heart rate to the high 100s. Will the Varekai in June be anything like this? Or would it be so much more spectacular. I’m betting on the latter! Excited! Boy: Ayoko nga! Di pa ako ready e.
Boy: Demanding ang mga girlfriend. Gusto ganito. Gusto ganyan. Ewan! Girl: Gusto ko lang naman ng… mcdo fries eh.